Physicists at Johannes Gutenberg University Mainz (JGU) have received the announcement of the winners of the 2013 Nobel Prize in Physics with considerable delight. The awarding of the prize to François Englert and Peter Higgs pays tribute to their theoretical prediction of the Higgs boson, the existence of which was actually confirmed in 2012 at CERN in Geneva. "For decades, many experimental physicists have been trying to detect this particle, and it was only last year that the search finally proved successful," said Professor Volker Büscher of Mainz University. "It is really a great honor that the Nobel Prize in Physics was awarded this year for the prediction of the Higgs boson." The existence of the Higgs boson, named after the British physicist Peter Higgs, was first postulated in 1964. It is the last piece of the puzzle that has been missing from the Standard Model of particle physics as it is the Higgs boson that actually imparts mass to all other elementary particles. According to the physicists' theory, the entire universe is permeated by a so-called Higgs field. The mass of individual particles is determined by how strongly they interact with this Higgs field. The detection of the Higgs boson has for the first time directly demonstrated that this field really exists. In addition the Higgs boson might open a window to 'new physics' beyond the currently accepted Standard Model, which can only explain part of the matter present in the universe. The discovery of the Higgs boson was made possible by the data recorded by the ATLAS and CMS detectors at the CERN European research center in Geneva, Switzerland. Scientists from Mainz were directly involved in this discovery. The Experimental Particle and Astroparticle Physics (ETAP) working group at Mainz University contributed significantly to the analysis of data from the ATLAS experiment and also designed and constructed parts of the detector. The award of the 2013 Nobel Prize in Physics for predicting the existence of the Higgs boson is not just a celebration of the achievements of the past 50 years, but it also points the way into the future. "The Higgs boson opens a window to 'new physics'," explained Büscher, noting that precision measurements will be undertaken in the coming year with the help of the LHC and a new linear accelerator in order to study the new particle more precisely and to better understand its function. Some 50 physicists at Johannes Gutenberg University Mainz are involved in the research being undertaken at CERN. Mainz physicists working in this area are part of the Cluster of Excellence "Precision Physics, Fundamental Interactions and Structure of Matter" (PRISMA). The research performed by the physicists from Mainz and other German universities was funded to a significant extent over many years by the German Federal Ministry of Education and Research (BMBF). 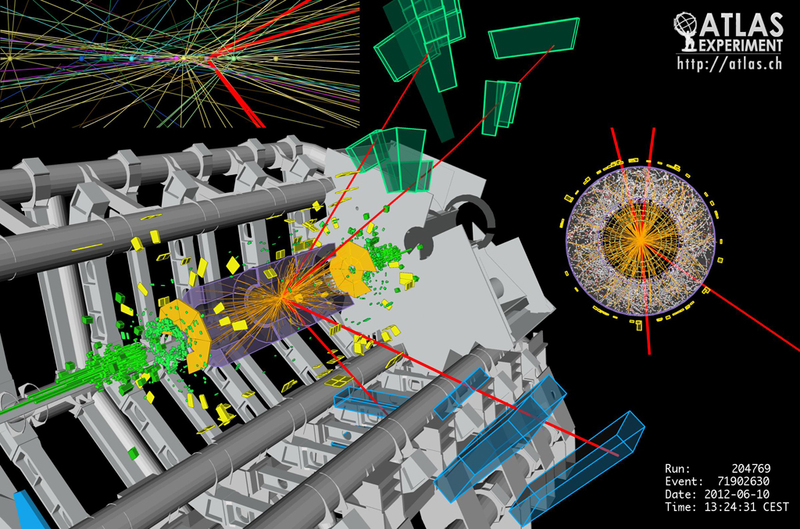 The image shows a collision recorded by the ATLAS detector on June 10, 2012 during which a Higgs particle was generated with a high level of probability. This boson immediately decayed to form other elementary particles (muons, represented by red lines).